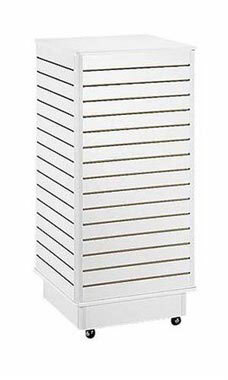 White Slatwall Towers with rolling bases create a high-impact selling unit anywhere in your store. They are easy to move because of their rolling base, which adds to your showroom display options. You can also pair these towers with multiple slatwall accessories to complete your display. These accessories come in multiple sizes and include slatwall shelves, brackets, faceouts, peg hooks, and other display options. The tower has a beautiful wood grain white melamine finish that increases shelf presence for any product. The unit stands at 24'' x 24'' x 48''H with an included 6"H base. They are in stock and available for immediate shipping!